Today we’ll focus on cooling and ice bandanas. The former are to be merely soaked in water while special gel packets are placed into the latter. Such cooling gadgets as personal cooling systems stand out. They are not like all others; they are premium priced but are they worth their price tag? We’ll find out at the very end of the article. If you’re dying of overheating, move on straight to our rating! We’ll start with the simplest and most universal inexpensive fabric bandanas where the price tags begin at $2 and never exceed $9. No special fluids, ice or freezer are required to use them, you’ll do with the water only. Then some special polymers act as they provide for such bandanas’ cooling property. Your bandana, in turn, will keep you cool for 2-3 hours. The moisture is retained thanks to the fabric’s special texture which distinguishes these devices from regular wet towels. We’ve picked TOP-3 items. The first bandana can absorb much more moisture because of its dense texture and will suit the athletes both in the gym and during long cycling rides. If you need a disposable bandana, which will be thrown out and replaced with a new one without any remorse as soon as it gets worn out, then invest into the second option, as it is quite affordable and of acceptable quality. The third item’s manufacturer used special cooling crystals which absorb even more moisture. Would you like your bandana to retain moisture for 3-5 hours? If you do, opt for this product, as a PVA polymer has been used in its making so it could absorb much more moisture and retain it longer than a regular bandana. Plenty of colors are available and both cowboy fans whose rancho tasks will be more ambient as they will be able to relate with the atmosphere and fashionistas who spend their leisure time taking yoga or cross-fit classes. The latter should be especially exuberated by the bright colors. By the way, Khloe Kardashian has lately re-introduced bandanas as a fashionable accessory. There are a total of 7 colors available, so the choice is sufficient. Although this item is executed as a classic cooling bandana, it costs less as it absorbs a bit less moisture and it evaporates slightly faster. You’ll have to soak it every 2-3 hours depending on the temperature. Several patterns are available, such as patriotic ornament with the U.S. national flag, biker-styled, flame, camouflage and others. Low price has affected quality as the users complain of the thin fabric which dries too fast. This is a decent and inexpensive option for those who feel like gardening for an hour or two when it is sunny and would like to avoid a heat stroke. You’d better opt for something of superior quality for taking up sports or working outside for a long time. If such bandanas are too narrow for you, go for a multifunctional one, such as Mission Multi-Cool. This stylish transformer scarf by Mission is much larger than a bandana and can cool not only your neck, but also your entire head. It can be easily and conveniently folded in 12 different ways ranging from a regular bandana to a face mask which will protect you from dust or sand. All of the properties and use are still the same as the fabric remains wet for 2 hours.7 colors are available, and everyone can pick something for themselves, be It a construction worker or someone doing their morning jog. This bandana will be able to cool you for 5 hours or more, depending on the weather. From a distance, this item reminds us of one of Clint Eastwood’s cowboy scarves which he flaunted on his peak of fame. This bandana contains some packets with a special gel which is its main competitive edge. Because of said packets, the bandana looks voluminous, as if it has been inflated. You’ll have to soak this scarf a bit longer than others, for about 20 minutes. The colors available are just as diverse and will suit any kind of situation for gardening to playing golf. Some people can’t stand having wet fabric on their neck. They can’t even think of cooling if the annoying sticky scarf should be first removed! Also, the skin becomes damp under the wet wrap and allergies can occur. If this is a true story for you, then regular cooling bandanas or cooling towels won’t suit you, but you’ll probably enjoy an ice bandana. This is one of the few popular goods that should be refrigerated before use. As a rule, drivers or workers tend to disregard fancy design as comfort and salvation from heat are more important for them. This product meets these needs best. How does it work? In a very simple way: all you have to do is load special ice packets in the case and voila, here before you is a straightforward but reliable cooling device. 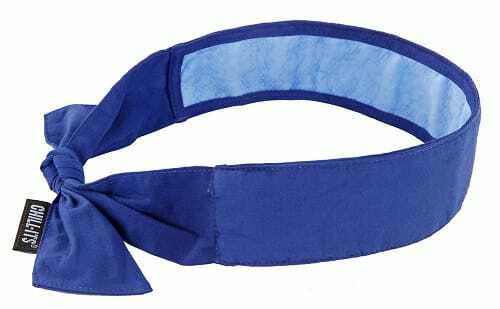 Long straps for comfortable wear of this bandana on your neck are its distinctive feature. Several colors are available, including blue, camouflage, gray, pink and red. Yes, the device still looks weird, but at least the manufacturer varied the design a bit. Do you think you are the one who suffers the most from the unbearable heat? Trust us; furry dogs have much harder time with it! We couldn’t neglect them so we found a cooling bandana and a cooling collar for pets. They have been sewn in such a way that they won’t slide off as they fit quite tightly, but at the same time your dog won’t feel discomfort while wearing it. This pets’ cooling bandana is available in three sizes: small (7.9 Lx7.9W x0.4 H), medium (11L x 11W x 0.4H) and large (17.7L x 17.7W x 0.4H). This ensures comfort as furrier dogs require items that cover more skin than short-haired dogs which would do with a small collar. Much depends on the climate as well. The bandana functions in the same way as a human one, and from time to time you’ll have to take it off and soak it. Yes, it might not be the most stylish or elegant product, but it serves its purpose well. Take a look at the next item if you’re looking for something to take out your pet to a party in. Have you obtained a cowboy cooling scarf? Take care of your dog as well by giving it a charming look with the help of a cooling collar! It comes in one size only, Large/XLarge (20" - 30"), and covers the neck only, so it is practically useless for hairier breeds. It is suitable for a walk when it’s hot though. However, if your pet spends much time in the heat, consider buying a dog cooling vest. Among obvious advantages the customers mention durable materials and fabric density. Personal cooling systems are ambiguous. Their appearance is extraordinary, the price is up-market, and the functionality is questionable. Are these gadgets currently worth buying? Let’s figure it out! In 2015 the scientists have pinned great hopes on such devices. Studies have shown that they can greatly improve the lives of those who often work in the heat. Ice packets and a special polymer fabric are useful, naturally, but why not find a more state-of-the-art replacement of a damp cloth in the world where smart sockets have already been invented? Here is what the manufacturers have managed to make. The first product, Black Ice Personal Cooling System, resembles the above mentioned Ice Bandanas much as is charged with cold inside a freezer rather than through an outlet or a battery. It looks too heavy, as it is literally a very massive collar. Does it work properly? The doctors approve of the effective heat fighting method of cooling the neck near the carotid artery. The device resembles greatly of an ice bandana as, according to the manufacturer, it takes 20 minutes to charge in “the ice water, freezer or refrigerator”. After that it will give off coolness of about примерно 57°F within an hour and a half. No spare packets are needed as the special liquid that requires neither removal nor any special preparation is already there. You simply should put the device in the water or inside the freezer. This gadget weighs about 12.8 ounces. Although it will cool you for a shorter period of time, it won’t stick to your skin as some bandanas would and doesn’t require long-term freeze like an ice bandana. The customers don’t really complain of the device and really, nothing can break down here. Things are much worse with the second product, Personal Cooling System 2.0 Neck Coolers. Do you remember the old “Deadlock” movie? It is the story of a hapless burglar who was placed in an experimental prison where he was made to wear an explosive collar in order to prevent prison break. Once you put this cooling system on, you’ll look just like an inmate of such a nano-prison. Will this portable AC be able to cool you quickly and comfortably? Well, the device itself works as an innovative wet bandana. The sides are removable and can be filled with water. Then, a special battery-powered module uses the air to cool the water that would in turn cool you. Many consumers complain that the device lacks versatility: «If you live in a humid state it works like a swamp cooler and will not cool down in warm moist air. Works best in dry climate.». Its another substantial drawback is that its design is more robust and the gadget itself is heavier than a cooling bandana. It turns out that you have to carry the entire device as well as the water that you load inside adding up to 396.893 grams. This is a one-size-fits-all type of item, so those with large necks will feel smothered by the device while it will hang on those who have more fragile necks. This cooling system is powered by a single AA battery and its charge lasts for 20 hours. Its obvious advantage is that you don’t have to constantly moisten the bandana in the water. Yes, the device works well, but many find it easier and more comfortable to use a regular bandana. The choice is yours entirely. If you are a fan of everything extraordinary, why not procure of such a thing? You will hardly lack attention while wearing it. Do these gadgets have any perspective? So far, we find it difficult to come to a definite conclusion. Cooling bandanas and polymer cooling vests compete fiercely. 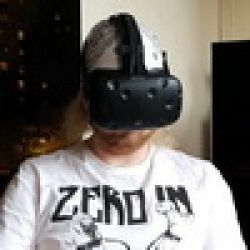 The important thing is that they are considerably cheaper than the experimental cooling systems and are virtually unbreakable. Why pay more for something that works worse then? Let’s see what happens next, perhaps, some innovations that would improve the previous versions will be introduced. In order to compare the items, as usual, refer to the chart below. Apart from cooling bandanas and wraps there is a whole bunch of devices for cooling when it’s hot. We have already reviewed cooling towels (you’ll find the information regarding the scientists’ research on cooling the carotid artery there) and cooling vests for those who need something more serious than small bandanas. Take care and don’t let the scorching sun ruin your day! 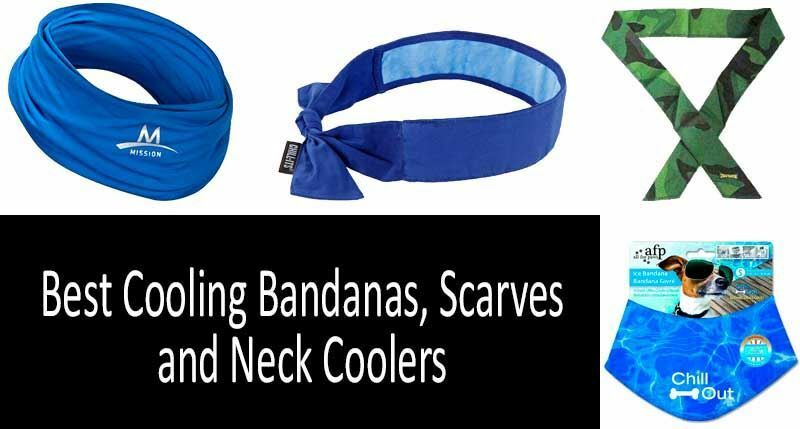 Try Chillimanjaro a new neck cooler that clips to the shirts neckline and stays in place while running, playing sports or working in the heat. Chillimanjaro uses real ice and provides instant relief. It's comfortable and almost unnoticeable to wear. You will have to refill with ice after about 20 minutes of use but the chilling is far superior than evaporating towels which I feel don't work very well. Since recently, I started running, because I decided to throw off a little extra weight to get myself in shape for vacation. I did not think it would be so hot, I'm running around in the afternoon, because I have work in the evening, and I need to communicate with clients. I work as a programmer, that's why it works. Tell me, does this cooling bandanas help in this heat? How long does it work? Is there a point in buying a dog cooling bandana? No, I never misused it. A friend of mine bought cool scarves, and you know what? Nothing! Just like the bandana, it didn’t work longer than 40-50 minutes. I’d rather use an ice pack, it gives a better effect! You are being too rough. My entire family is using the ice bandana and it feels great! Try to recall, maybe you did something wrong? Our bandanas cool greatly! Once I went to a soccer match wearing a cooling band. Half an hour into the game I stopped feeling coolness. I thought I didn’t use it right, but it turned out I followed the manual. What a useless item! Frankly speaking, I never timed its use, it was always enough. If you need short-term cooling, go for a gel neck wrap. How long does the cold neck wrap work? How many hours can I use it? Last year I bought a cool neck wrap. I used it all summer long because it was way too hot. That’s when I thanked God I had this gadget. This year I’ll buy one for my wife. Someone recommended me to buy Ergodyne Chill-Its 6700CT Evaporative Cooling Bandana. I’m in a miracle! I can’t stand heat so I used a pocket battery-powered fan to cool down a bit (or else I would go crazy). Everything changed when I met my ex-colleague who recommended this device to me. I’m so grateful to him and to this bandana’s manufacturers! Guys, help me. I wanna buy Dog Cooling Collar but I’ve never used such a device before. I decided to buy it as I’ve recently started jogging with my dog and it becomes very hot because of its fur, and so it sticks out its tongue and breathes heavily. So, should I buy it? Yep, I agree with the previous poster, it cools for five hours straight indeed. As for me, I use Icy cool Ice Bandana. I bought two of them: one for me and the other is for my wide. It seems to me that this is the best way to keep cool when it is hot! I used Mission Multi-Cool, it is not quite a bandana, but the idea is the same. Anyways, they all cool for the promised period stated on the label. I’ve been using my gadget for a whole month and it works flawlessly. Has anyone used MiraCool Cooling Bandanas? Does it really keep on cooling for five hours or is the actual working period shorter? I’d like to buy this khaki bandana but before I do I want to make sure it works just as promised. A personal cooling system is my choice. I love travelling in the summer that is why it is an irreplaceable life in my exciting daily life. Both my wife and I use this bandana. It really retains its cooling effect for a long time. I’ve realized that a cooling bandana is a great device for cooling in the summer heat. I never thought about this before, but last week I bought one. I don’t regret doing this. It works greatly, looks trendy and saves me from heat!